One of the most famous kinds of entertainment is gambling. It has gained its popularity with the help of various games on offer and plenty beautiful and gorgeous places to play them! It is nice to know that you can relax and enjoy the gaming process fully without making lots of efforts. One of the best ways to do that is to play casino games of chance! Most players love interesting and exciting. The main idea of the game is to predict the number of the slot on which the ball lands. The rules of roulette are pretty easy and anyone can learn how to place bets. However, all the roulette players should keep in mind that the winning probabilities differ depending on the type of roulette wheel they choose. European roulette and American roulette wheel have different number of zero slots which influences the house edge incredibly. 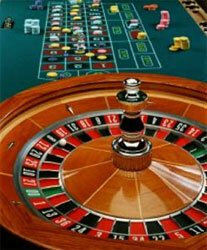 That is why players are advised to play European roulette due to the higher odds. In order to start playing roulette players should buy specially colored chips for placing bets. Every player has different color so not to mix up. The game is between the player and the dealer as the latter is responsible for throwing the ball and spinning the wheel. Players are allowed to place inside and outside types of bets until the dealer calls out "no more bets". It is possible to bet on even or odd, small (1-18) or big (19-36) numbers as well as on single number or black/red. The payouts are different for each bet but the highest is on single number (1:35). When all bets are placed the dealer spins the wheel and throws the ball, as well as at online casinos. As soon as it lands the dealer tells the winner. Players can bet as many times as they wish but they are not allowed to exceed the table limit. There are casinos that use this rule in the roulette game. "En prison" rule gives any player the one time opportunity to take the half of the bet back or to leave it for the next spin if the bet was made on even and the ball landed on zero. The same as 'En Prison' rule, 'La Partage' rule allows players to take the half of the bet back but it does not allow to leave it for the next spin. This rule is used for even money bets like even/odd, black/red, big/small.